Polish painter and illustrator active in Munich, Paris, and Warsaw, leading representative of realism. Born 1849 in Boczki near Łowicz, died 1914 in Kuklówka near Grodzisk Mazowiecki. A Polish painter and illustrator active in Munich, Paris, and Warsaw, leading representative of realism. Between 1867-1871 Chełmoński studied at the Warsaw Drawing Class (School) and in the private studio of Wojciech Gerson. In 1872, he continued his studies at the Munich Academy of Fine Arts under H. Anschütz and A. Strähuber. He became familiar there with the milieu of the Polish 'Munich painters', notably Stanisław Witkiewicz, Józef Brandt, Maksymilian Gierymski and Adam Chmielowski; he was admitted as member of the Kunstverein, with which he exhibited. In 1874 he went to Ukraine, from where he returned to Warsaw. He remained in close touch with Witkiewicz and Chmielowski, sharing with them an atelier rented at Hotel Europejski. In 1872 and 1874-1875 he makes several trips to Podole and Ukraine, the reminiscences of which will play an important role in the shaping of his artistic position. Disappointed with the critics' negative attitude towards his formula of realist painting, he leaves in 1875 to Paris. There he wins critical and public acclaim, showing at the Salons genre scenes from Polish country life and representations of horse teams - his famous Troikas and Chetverkas (threesomes and foursomes) - galloping across the steppe or pushing their way through snow. These paintings were eagerly bought by European and American collectors. Chełmoński's renown and financial success were further ensured by a regular contract with the well-known Paris art dealer Adolphe Goupil. Between 1884-1892 the artist collaborated as draughtsman-illustrator with the Paris-based periodical "Le Monde Illustré".In 1887 he returned to Poland and settled in Warsaw. At the end of 1889 he moved to the village of Kuklówka near Grodzisk Mazowiecki, where he ran a farm. Providing themes for his paintings were his trips to Podole, Ukraina, Volhynia, the Pinsk region, Polesie, and Lithuania. He was active on the exhibition circuit; from 1869 he presented his works at the Society for the Encouragement of Fine Arts (Zachęta) in Warsaw, and from 1871 - at the Krakow Society of the Friends of Fine Arts. Between 1880-1906 he showed at the Aleksander Krywult salon in Warsaw. During his residence in Paris he participated in the Salons (1876, 1878, 1882). He also showed his work in Chicago (1893), Vienna (1898), and Dusseldorf (1904). His solo exhibitions took place in Warsaw (1890, 1907, 1917, 1924, 1927), Krakow (1907), and Lviv (1907). He was presented with numerous awards, including the Grand Prix at the Exposition Universelle in Paris (1889), and gold medals at the Glaspalast exhibition in Munich (1894) and the Midwinter International Exposition in San Francisco (1894). In 1897 he was elected honorary president of Krakow's newly formed 'Sztuka' Society of Polish Artists, among the members of which were the most outstanding Polish artists. Chełmoński's oeuvre fully reflects the artistic position of the 19th-century realist, based on a perfect painting and drawing technique and a close observation of nature. As opposed to the conventions of realism dominant in Munich and the formula propagated in Paris, Chełmoński's work was focused on the countryside, emphasising indigenous 'Polishness' and Ukrainian familiarity, presenting the specificity of a country he was emotionally attached to and the images of which he forever preserved in his memory. Of important significance for the development of Chełmoński's artistic preferences and technical skills was the person of Wojciech Gerson, who not only initiated his students into the mysteries of the academic conventions, but also instilled in them a love for direct contact with nature. Under the master's influence, the young Chełmoński painted lyrical nocturnes evoking a melancholic aura, confined to a narrow scale of greys, blues, and greens (Cranes, 1870; Cranes Migrating, 1871). During his Munich period, the artist achieved technical perfection, focusing his attention on familiar themes, motifs of the Polish countryside, farmer's markets, fairs, and horse teams (In the Stables, 1872; Case Before the Bailiff, 1873; Ukrainian Foursome, 1873). Plagued by nostalgia for his home country, he went in 1874 to Ukraine, whose landscapes provided him with a powerful creative impulse. In the pieces painted immediately following his relocation to Warsaw, Chełmoński moved away from the academic rules of depiction on behalf of a thorough observation of the rural daily life serving as a starting point for a reflection on the condition of human existence subordinated to the rhythms of nature (Town in Volhynia, 1875). The pieces created at the time - Indian Summer, At the Manor Farm, Autumn - became programmatic manifestations of Polish realism. Pure nature also started playing an increasingly important role in the artist's practice, landscape motifs, painted in a sketchy, synthetic manner, gaining in significance. During the Paris period reminiscences of the artist's Munich affiliations became more pronounced; a change occurred in the way the represented scenes are 'directed' and composed. The dynamism of the galloping horses, the bravado rush of the carriages, the vitality of the peasant trying to rein in the frenzied animals, as well as naturalistic illusionism, complex perspective foreshortenings in the way the animal and human figures are rendered - all those are the characteristic features of Chełmoński's paintings, appreciated by the Paris critics, sought after by the dealers, and fascinating the public with their 'exoticism' (Foursome Exercise, 1878). In episodes taking place in the farmyard, in front of the inn, during hunting trips, the artist skilfully constructed a multilayered narrative, emphasising the folk customs, costumes, and types (Oberek Folk Dance, 1878). The usual accompaniment of those common events was a rainy day with a misty, diffused light that blurred the outlines of cottages, human and animal figures with the scenery. It was precisely that light, just as its reflections on muddy ground, that was the quintessence of the memory-evoked familiar landscape; it was it that muted the colours of nature, narrowing them down to a range of browns and greys. As if to enliven the space for decorative purposes, the artist introduced small accents of reds, oranges and cloudy whites (In Front of the Inn, 1877). The images of country entertainments, fairs and markets presented a wide range of plainly characterised types from the different social strata, from the horse-buying noblemen, through the vigorous managers and Jewish vendors, to the obtrusive beggars and paupers (Farmer's Market, 1882). Having achieved technical mastery and developed his specific painting style, Chełmoński became affected in his work; lacking direct contact with his home country, he had to aid his memory with photographs, sketches and old notes (Memory From Trip to Ukraine, 1877). 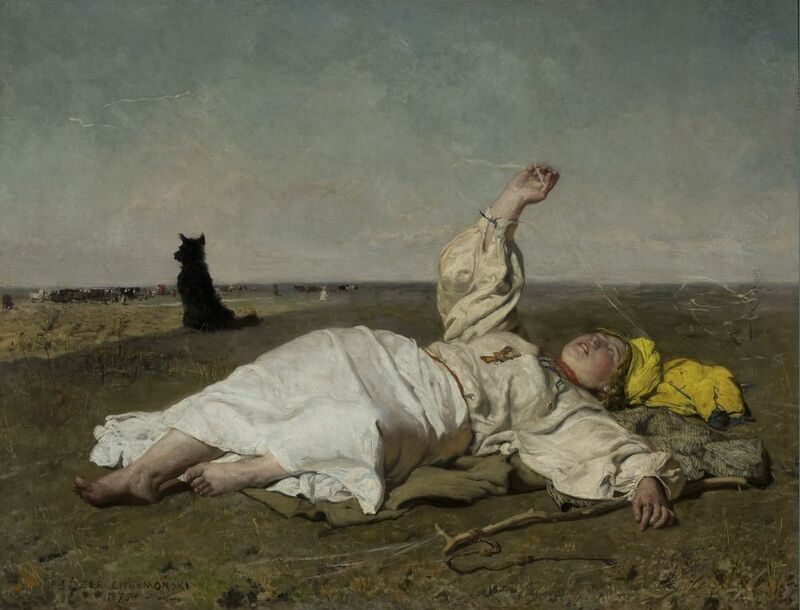 Still, he created during the Paris period pieces belonging to the very canon of Polish realism, such as the nostalgic Winter Night in Ukraine (1877), the flawlessly composed Horse Market in Bałta (1879), or the monumentalised Steppe Foursome rushing directly towards the viewer (1881). The artist was also interested in the landscape painting of the Barbizon school, holding in particularly high regard Camille Corot, Charles François Daubigny, Théodore Rousseau, and Constant Troyon. Inspired by the way they perceived nature, he focused his attention upon his return to Poland on the pure landscape, noticing an important painterly theme in the horizontally stretched Mazowsze fields with the leaden sky hanging above them. He started searching for manifestations of God's presence in the changeability and harsh beauty of nature (Under Your Defence, 1906). Vast expanses of meadows strewn with spring blossoms, a dirt road running amid fields, surfaces of bogs, floods, and ponds shimmering with reflections of light - these are the most frequent motifs of Chełmoński's late work (Pond in Radziejowice, 1899; Spring. Marsh Marigolds, 1908). The sceneries' nostalgic aura is enhanced by birds - lapwings, cranes, herons, moorhens, and partridges - hanging in midair, circling overhead, wading in water, flying in V-formations (Jay. Hoarfrost, 1892; Fine Weather. Hawk, 1899; Dawn. Bird Kingdom, 1906; Welcoming the Sun. Cranes, 1910). 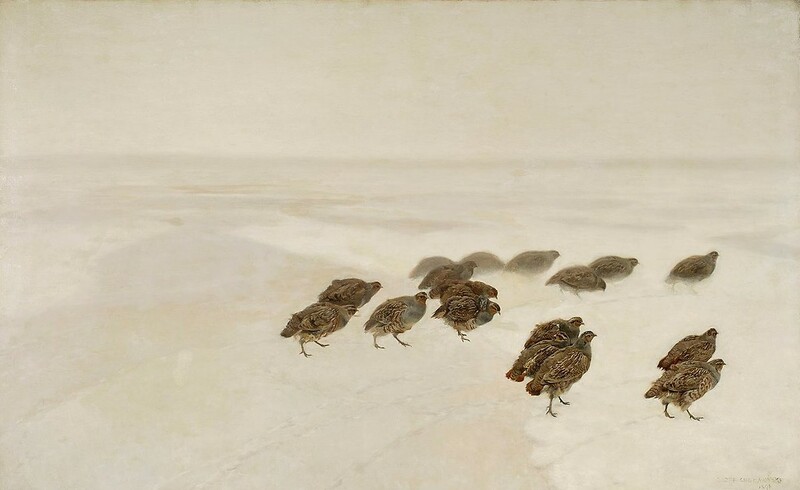 In some paintings from the period the artist goes beyond the boundaries of realism, expressing a pantheistic perception of the world (Partridges, 1891; Cross in Snowstorm, 1907). In a manner characteristic for the symbolists, the landscape was for Chełmoński but a starting point, a visual impulse inspiring a reflection on the sense of existence. Dawn, dusk and night became his favourite times for communing with nature (Moonlit Night, 1906; Dniester at Night-Time, 1906). The mist trailing over the ground and the grey light of the morning hid the details of the scenery from view, giving precedence to subtle nuances of colours and values (Dawn, 1892).